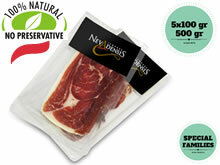 The Sliced Serrano Ham is a packaging format very practical and very convenient because it lets you quickly enjoy a serving of Spanish Ham. All our hams are hand-carved with a knife (specially designed to slice Serrano Ham). 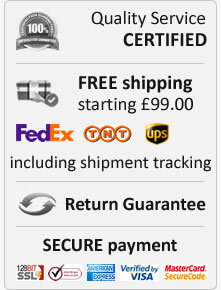 The resulting slices are vacuum packed immediately, to preserve intact all its properties, in packs of 80, 100 or 120 grams. 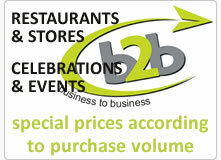 Easy and convenient packaging to enjoy anywhere. Thin slices, cut by hand, in 5 packs of 100 gr (5 x 100 gr each) of our Gourmet Serrano Ham Black Label Special Families 20 Months. 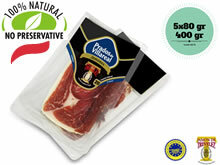 Thin slices, cut by hand, in 5 packs of 80 gr (5 x 80 gr each) of our Trevelez DO Serrano Ham Black Label Gran Reserva. 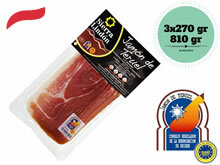 Thin slices, cut by hand, in 3 packs of 270 gr (3 x 270 gr each) of our Teruel DO Serrano Ham Gran Reserva. 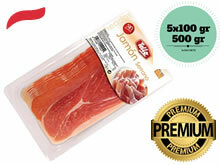 Thin slices, cut by hand, in 5 packs of 100 gr (5 x 100 gr each) of our Duroc Serrano Ham Gran Reserva 24 Months. Qualities and Types of Serrano Ham. 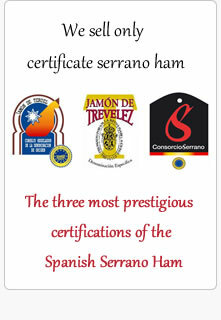 Serrano Ham - Designations of Origin (DO).